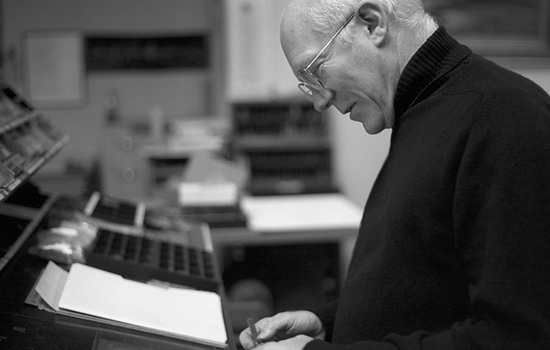 Robert Bringhurst, a leading poet, author and typographer, will receive the Goudy Award for his outstanding work in typography Nov. 17 at RIT. Presented by Rochester Institute of Technology’s Cary Graphic Arts Collection and RIT’s School of Media Sciences, the award dating back to 1969 is dedicated to the continued progress of the printing field in the spirit of the great printers of the past. The 29th presentation of the award and the Goudy Distinguished Lecture in Typography will be made at 7 p.m. Nov. 17 in RIT’s University Gallery. The event and reception is free and open to the public. Bringhurst is the author of dozens of books of poetry and prose, including the recent Selected Poems published by Jonathan Cape in London. His most influential reference book, The Elements of Typographic Style—first published in 1992—is now in its fourth edition and has been translated into 10 different languages. In his lecture, Bringhurst will discuss how people give names to things and ask what typographers and typographic historians can learn in this regard from biologists, art historians and other specialists. Bringhurst’s groundbreaking study of a Native American oral literature, A Story as Sharp as a Knife: The Classical Haida Mythtellers and Their World, with its two companion volumes of Haida oral poetry in translation, was awarded the Edward Sapir Prize by the Society for Linguistic Anthropology and chosen as Literary Editor’s Book of the Year by the Times of London. He is also an Officer of the Order of Canada and was recently awarded an honorary doctorate by Simon Fraser University. Bringhurst’s most recent book, Palatino: The Natural History of a Typeface, is study of Hermann Zapf’s most famous family of typefaces. He is also the author of The Tree of Meaning, Everywhere Being Is Dancing and What is Reading For?, which is published by the RIT Press. The Goudy Award was established in 1969 by a gift from the Mary Flagler Cary Charitable Trust. The award pays tribute to the friendship between Melbert B. Cary Jr. and Frederic Goudy, who produced upwards of 123 typefaces and was one of the most widely recognized figures in American printing.